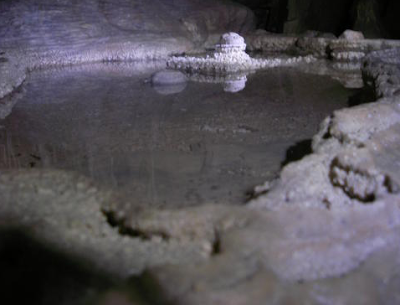 The mock pond, usually found in small subterranean depressions, eerily resembles a small body of water, right down to the ripples and simulated fauna. If a creature attempts to drink from the pond it will become hopelessly stuck. Organisms trapped this way are digested very slowly by the pond. In fact one clue to the location of a successful mock pond is a ring of creatures face down in a mysterious pool. Mock ponds are thought to be motile, and the adventurer that puts great stock in the pond as a landmark may be disoriented on the next visit to its cavernous domain. So in theory carrying a pocket full of pebbles and throwing them into every pool you find would give away mock ponds?